The video features economist Russ Roberts and cameo appearances by Nobel laureate economists Gary Becker, Vernon Smith, and the late Milton Friedman. I use price anti price-gouging laws as an example of price ceilings. By threatening firms with penalties if they raise prices "too much", government makes prices upwardly-sticky. By not allowing prices to rise, government takes away the primary incentive that drives people to supply gas, water, generators, and all the other things desperately needed when natural disasters hit. Does time have no value, oh those who think price "gouging" is a bad thing? Apparently not, especially when it's not your time that's being wasted. Other people's time/money/stuff, and whatnot. Do Price Gouging Laws Drive Prices Higher? Hurricane Ike made landfall overnight on Sept 12/13, 2008. In the days before that, there were reports of gas price gouging and governors of several states declared states of emergencies which put anti gouging laws into action. Four of these states were North Carolina, South Carolina, Arkansas, Alabama, and Tennessee. 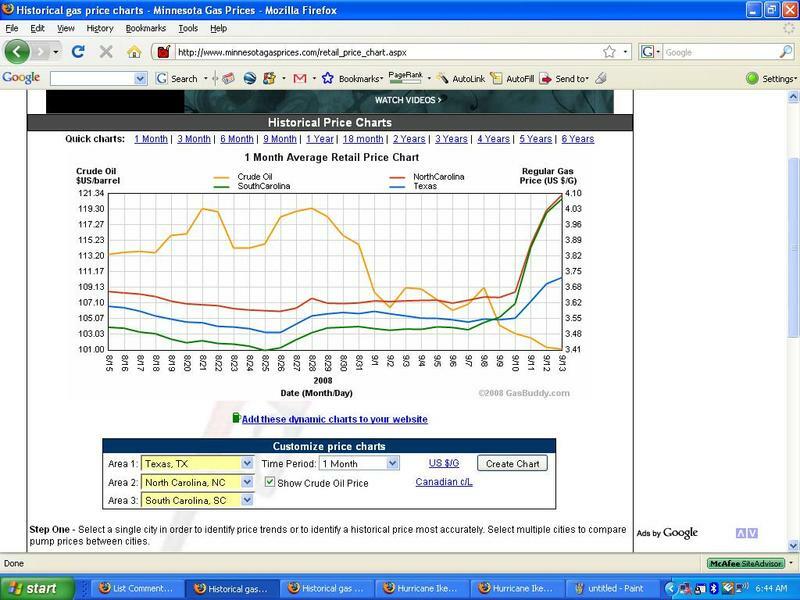 I went to minnesotagasprices.com and plotted some data to see the what happened to gas prices in those states. For reference, I add gas prices in Oklahoma and Texas, two states that have not been active in going after so-called gougers. 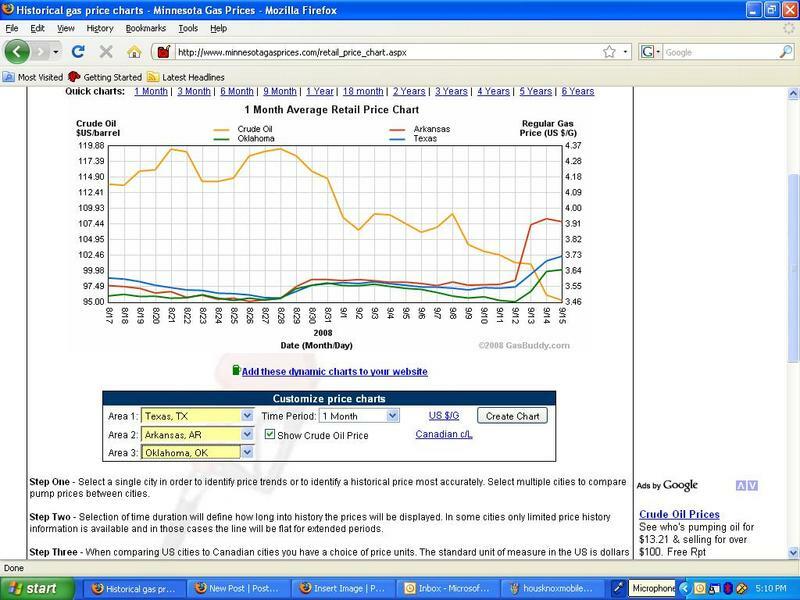 I also add the price of a barrel of crude oil to standardize the look of the graphs. Here's the screen shot from 5:10 PM on 9/15 for Texas, Arkansas, and Oklahoma. Click on the image for a larger version. 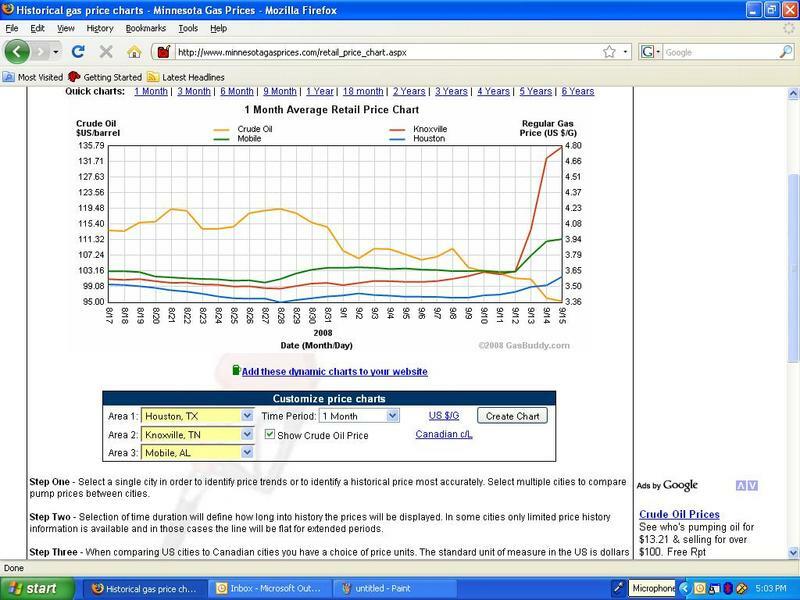 Even though crude oil prices have fallen, the price of gasoline rose in all three states as Ike neared the Gulf coast. But the price increase was higher in Arkansas that in Oklahoma or in Texas. Here is the plot for North Carolina, South Carolina, and Texas taken at 6:44 AM on 9/15. The average price of gasoline rose in all three states, but it spiked in North Carolina and South Carolina. Texas was directly hit by Ike, the Carolinas were not. Here is a plot for Houston, Knoxville, Tn. and Mobile, Al. taken at 5:03 PM on 9/15. All cities saw the average retail price of gasoline increase, but it spiked in Knoxville (and there were reports of shortages). The average price of gas rose faster in Mobile than in Houston. Lastly, here's Houston, Charlotte, NC, and Columbia, SC taken at 5:14 PM. Similar story. 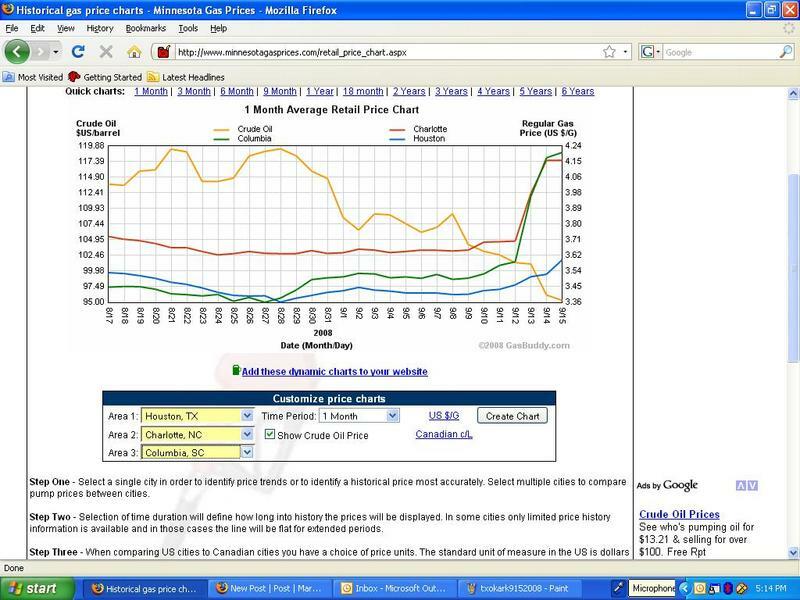 Gas prices rose in all three cities, but they spiked in the two Carolina cities. What seems to be the lesson here regarding these particular price spikes? Aside from the other effects of Hurrican Ike, effects that also drive prices higher, it seems that the gas price gouging laws impose an added cost on gasoline retailers: a potential fine that they'll have to pay if they are deemed to have increased their prices "too much" (as well any expected costs of defending themselves). The result is less gasoline on the market and higher prices to consumers than in the absence of the gouging laws, all else equal. It seems that instead of keeping gas prices low, they actually drive gas prices higher in states of emergencies. Here's another effect of gasoline price gouging laws: waiting lines. On Friday, some stations ran out of fuel, some raised prices dramatically and some asked customers not to buy too much gas, said David Parsons, president and chief executive officer of AAA Carolinas. But by Friday afternoon, some stations in North Carolina were charging nearly $5 a gallon for regular unleaded and more for premium, and some in the Wilmington area were saying $5-a-gallon gas might be just hours away. And it was apparent by the long lines at many Wilmington-area gas stations that many local residents weren’t taking AAA’s advice. Frank Johnson was one of the many hedging his bet and filling up his tank just in case Ike caused prices to go any higher or gas stations to start running dry. Knoxville-area drivers are seeing more bags on gasoline pumps today as a petroleum shortage spreading throughout the Southeast hits local gas stations, groceries and convenience stores. Refinery outages along the Gulf Coast in the wake of Hurricane Gustav have created severe shortages, causing retailers like Weigel's to scramble to keep their pumps flowing. And Hurricane Ike is bearing down on Texas, drawing a bead on North America's petroleum manufacturing capital of Houston and portending a worst-case scenario for dealers and consumers. "Knoxville has been out of gas since Monday. We've been buying gas from Atlanta, North Carolina, Kentucky, anywhere we can get it," said Bill Weigel, head of the Weigel's chain of convenience stores in Knox, Blount, Sevier, Loudon, Anderson and Monroe counties. Weigel said Thursday about a half-dozen Weigel's stores are out of gas, including Oak Ridge locations, and he fears that number will grow as gasoline shipments from Louisiana and Texas refineries through a network of pipelines are disrupted. I've said it before and I'll say it again. Gasoline is scarce, relative to the amount people want, and must be rationed. Here we have an unusual event that decreases the supply sharply and increases the demand sharply. But by trying to "do something", politicians who voted for these laws have now made it more difficult to get gasoline in these states because raising prices now carries a penalty. How, then, is gasoline to be rationed? HT to Kip in the comments to this post. Where can we report gas stations that are price gouging when a hurrican is in the gulf? To competitors who are not. They'll be happy to hear it. You might also try reporting it to texasgasprices.com so that customers can be informed. That will do more good than reporting it to some government agency. Never mind that these things have been investigated by government before, and the search turns up empty. Gasoline is scarce and must be rationed somehow, someway. If everyone is told to evacuate an area, it becomes even more scarce in that area. If we don't allow the prices of gasoline to rise, how then is it to be rationed? And, pray tell me why that way of rationing is better than using prices.